Violence disturbs. And violent depictions, when encountered in the biblical texts, are all the more disconcerting. Isaiah 63:1-6 is an illustrative instance. The prophetic text presents the "Arriving One" in gory details ('trampling down people'; 'pouring out their lifeblood' v.6). Further, the introductory note that the Arriving One is “coming from Edom” (cf. v.1) may suggest Israel's unrelenting animosity towards Edom. 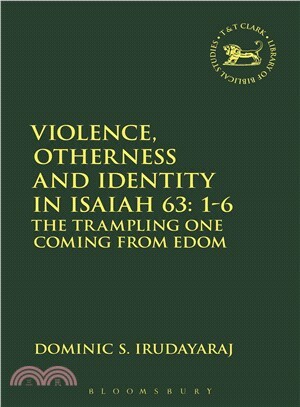 These two themes: the "gory depiction" and "coming from Edom" are addressed in this book. Irudayaraj uses a social identity reading to show how Edom is consistently pictured as Israel's proximate and yet 'other'-ed entity. Approaching Edom as such thus helps situate the animosity within a larger prophetic vision of identity construction in the postexilic Third Isaian context. By adopting an iconographic reading of Isaiah 63:1-6, Irudayaraj shows how the prophetic portrayal of the 'Arriving One' in descriptions where it is clear that the 'Arriving One' is a marginalised identity correlates with the experiences of the "stooped" exiles (cf 51:14). He also demonstrates that the text leaves behind emphatic affirmations ('mighty' and 'splendidly robed' cf. v.1; “alone” cf. v.3), by which the relegated voice of the divine reasserts itself. It is in this divine reassertion that the hope of the Isaian community's reclamation of its own identity rests. Dominic S. Irudayaraj S.J. teaches in Hekima University College, Nairobi, Kenya.